Fear not BREXIT does not mean doom and gloom for overseas property. We shared our views with the Sunday Times on 26th June. 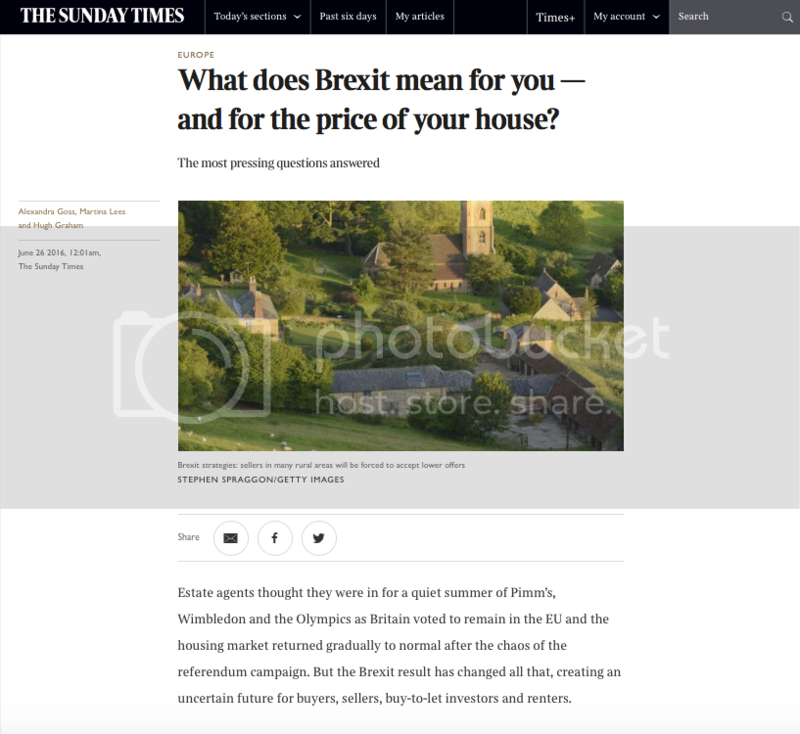 Yes potentially some short term hesitancy from British buyers but we do not believe that Brexit, in the longterm, will deter the British from purchasing beautiful second homes in Europe. The warm climate and lifestyle of the southern European nations will always draw the British. Just let the euro settle down and they will be back. Agents stayed in business through the financial crisis, still doing deals when the euro hit 1.11 to the pound. So why could Summer 2016 be the time to buy? If you have your money in euros already or if you are from outside of Europe then now, i.e. this summer, is in fact a great time to make the move on that purchase. And why you may ask? Narrow your search down to properties with British owners and if they are intent on moving back to the UK, or at least wishing to convert the proceeds of the sale into sterling, then presume there to be a good level of negotiation possible. Whilst last summer saw the euro-sterling rates exceed 1.4 euros to the pound – this was good news for any British buyers but British vendors, when converting back into sterling were somewhat disappointed. The impact Brexit has had on the exchange rate, not just in the past few days, but in fact over the course of this year, with rates hovering around 1.25 to 1.30 euros to the pound property owners will be getting significantly more sterling when converting the proceeds of the sale. That rate has dropped further so even better news when converting back into sterling. Use this to your advantage and negotiate hard. This has been an ongoing trend over the last 12 months and now with so much pressure and uncertainty swirling around the EU the euro is taking a hit too. How to use this to your advantage if you are selling? If you want or need to sell this summer, it is all important to market your property to buyers outside of Europe. Buyers from further afield have been increasingly coming into the European property market over recent years – Chinese buyers investing in properties with vineyards; Middle Eastern and Indian buyers purchasing city properties; Kazaks, Russians and Ukrainians buyers buying up coastal properties in Mallorca and the Cote d’Azur. Attract those buyers, at a time when the euro is weak against other currencies and you stand a good chance of making a swift sale. At The Viewing all our properties are marketed in English, Chinese and Russian, we provide listing on portals worldwide and advertising opportunities to hit buyers and investors in 170 countries. The original article can be accessed on The Times online with a subscription.